This topic contains 281 replies, has 81 voices, and was last updated by Rhys Humphrey 2 minutes ago. Thought I would start a thread on our painting area’s. Prunkland’s Regiment von Renscher getting dressed whilst comrades from Regiment von Eintopf look on from a Renedra campsite. Spencer Smith original plastics, circa 1973. Three battalions of Baccus Napoleonic Bavarian light infantry, a few 28mm Napoleonic French line, some 28mm WW2 Italian infantry, a house, some interestingly shaped sticks, and of course……Vikings! Some day soon I’ll have a painting desk again…for now it’s an old baking tray…filled with 15mm WW1 French Germans and British. I need to paint more. Obviously not all this is on my desk at one time, currently about 300 Baccus Wotr and the H&R paras, as each batch gets finished I drop another on there. 15mm Taliban and US Infantry from Khurasan, 25mm Samurai from Black Hat, 15mm Private Military Contractors from Rebel Minis, a single 28mm fig from Wargames Supply Dump, 28mm Space Rangers from EM4 Miniatures, 28mm Studio Miniatures Zombies and survivors, and who knows what else. I am working on 16 old Front rank French cavalry, 24 Spencer Smith plastic cavalry being painted up as Swedish to be in French service because I want them to be. 24 RSM and 24 Warrior miniatures painted up as le Marck regiment in French service. 2 X 20MM 150MM guns, and several other things. Finishing bases for 10 28’s and 4 dinos. The Old Glory 28mm hotel is next to get finished then some 1/35 and 1/48 models that have been sitting around. Wow those Spencer Smiths bring back memories. A mould for a new Stonehaven building. Some Jurapeds, some Bullfrog pick up trucks. Gaps where the things I have to paint next should be, the next things to paint are somewhere else, possibly explains why they are not painted as they are not on my desk. A bunch of 1/32 Pegasus plastic Gladiators. For Jugula. Northern Monkey – you need a bigger desk, mate! As for your 6mm WOTR project, well the numbers are impressive but did you see the “Rather Large Towton Project”? If not, I recommend you google it. Great inspiration! My workspace is in my shed. Plenty of space to store the ‘lead pile’ and SWMBO is none the wiser. She doesn’t have a key…..
Oh man! This is going to show how disorganised I am! 3. Unit of 40 professionally painted 28mm Nap British Foot Guards (2/2nd) from Fons – need to assemble and paint a further 2 to bring them up to 42 then base and flock the lot. 4. Broken 1/72nd scale Stuka G needs some TLC after being dropped onto concrete when being brought home after Thursday’s game. Ouch! Early Saxons and Picts. I only work on one project at a time, so it will be Saxons, Picts and Late Romans till the end of the year. Wow! Now there is a disciplined man! Not too many figures right now…15 cavemen to be painted. I have 15 dino-raptors painted but yet to be flocked. I have been trying to focus on terrain in 2014. Other than some diversions into pulp figures, I have gotten a lot done. I finished some western and Japanese buildings in the Spring. My scratch-built outhouses look great. Jungle, Egyptian ruins, fantasy (LOTR) scaffolding for subterranean and urban terrain have all been on and off the table in the last 2 months. I still have to cleanup some ‘Project Bricks’ from some stonework Egyptian terrain. I have to weather and detail some gray ramps and walls and elevators for Death Star gaming. My GW Hobbit Goblin Town terrain still needs to be dipped…I under-paint it to de-emphasize the skulls and silly bits. Most of my jungle stuff is in the can. A few trees need some finishing paintwork and flock. I have been very productive this year. I got a sudden bug to paint up some old Legions of Steel minis I’ve had forever but never built/painted. Most likely to end up in a game of Rogue Trader. Riotous old figures that have a lot of character on them. This reply was modified 4 years, 8 months ago by venusboys3. Don’t you just hate it when you start painting a regiment of Spencer Smiths and then accidentally start painting an entire army of goblins? Taking a break from 28mm Napoleonic Spanish (4 units done, 2 more to go) and doing a few Foundry Thracians. The Spanish are part of my Napoleonic refurbishment project; Victrix plastics (early French in bicorne painted as Spanish) and Elite metal figures for the grenadiers. I find I can only do so many Napoleonics and then I have to do a tank or some ancients or gladiators…. Sorry Cedric, didnt see this post til just now, yeah Ive drooled over the Towton project, bit out of my league though, I do plan on playing it out though just at a smaller figure ratio, just finished the buildings to represent Saxton & Towton and Lead chapel using Leven miniatures. I only live about 5 miles from Towton so its a major interest of mine. 60 28mm assorted Medieval Hungarian cavalry (knights, horse archers, hussars etc) plus a couple of war wagons; also just waiting on a package from Warlord so I can finish off a couple of Universal Carriers. Those universal carriers were a key element in the success of the Kingdom of Hungary in the C14th, but were replaced by surplus American M3 halftracks from 1420 onwards. They were considered better against crossbow bolts. This reply was modified 4 years, 8 months ago by Howard Whitehouse. Because I cannot complete one project before starting another, I have a bunch of old Grenadier half-orcs to finish basing after painting, 40+ Darkest Africa types to send to a customer, more of those primed, and some Woodland Indians from Footsore and Pulp Figures that need final details completed. Those were the ones made with square bullets for use against infidels, right? Was that the Puckle gun? Howard, do you mean the Puckle Gun? It could fire rounded bullets for the so-called “civilized” folk and square ones meant for Muslims. A nice irony of the Puckle Gun was that square bullets are hopelessly un-aerodynamic so whilst it might have been passably efficient at killing Christians it was absolutely hopeless at slaughtering the infidel. oops a link has already been made..
That’s the one. I recall it from “My Bumper Book of Completely Unsuccessful Inventions”, which I got when I was twelve. I don’t have it any more, because it was bound together with an amazing new process involving spit. I’ve lost my painting mojo….and I’ve only a couple of hundred 15mm figures to get painted by Sunday…That and I need stronger reading glasses to see the damned things. That’s why I do not paint smaller than 20mm, don’t get me wrong there are some lovely 18, 15, 10, 6mm figures and equipment out there but a man can only paint so many things in on life time. I swap between various scales 20mm -25mm-30mm (sometimes 54mm) to keep the mojo following, I tend to paint in small batches of 30 – 40 figures of one scale whilst working on figures or equipment in an other scale. Variation of tasks to keep the interest level high. 20mm Airfix, ESCI, Revell and caed model Merit walls. Just several items I have been working on over the past few months. This reply was modified 4 years, 8 months ago by willz. Just finishing off Napoleonic Frankfurt Regt (18mm Blue Moon), and then starting on either Nassau Jager zu Pferde or my second Nassau unit. I’ve kept the amount of unpainted stuff to a minimum only buying the next couple of units once the current one is underway to try and stay disciplined. I only got back into the hobby a year or so ago and have been putting off painting for ages as I hadn’t done any since about 1985. I did get some 10mm initially which I tried painting but I got frustrated as I couldn’t do it (I used to do 6mm in the old days). 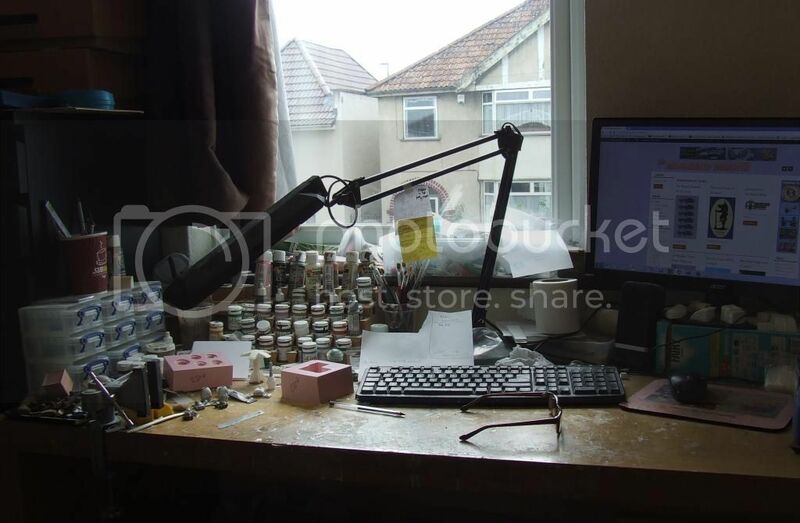 After buying some reading glasses and switching to the 18mm’s I’ve actually enjoyed it, I’ve got meself a desk so should really crack on at a better rate now that I’m not trying to compete for space on our big table (my missus is an artist so she gets first dibs on it). Oh yeah, it has got some recent football trophies on it too – heretical I know but there’s nowhere else for them to go and as I’ve just been benched for good due to my health problem I can’t seem to put them in a box quite yet. (Sad innit). William — some lovely stuff there. Brilliant paint job on the Spencer Smiths! Cheers for your kind comment Henry. Meant to post these at the beginning of the week finished them Monday night. Figures old Front rank, one Ebor, one Elite. Painted as generic French cavalry 1740-ish with standard that can be changed.